I have attended school football games when our team won but I have never experienced the excitement of a whole class winning a poetry prize – until now. On October 1st I visited Eglinton PS for the first of four sessions. 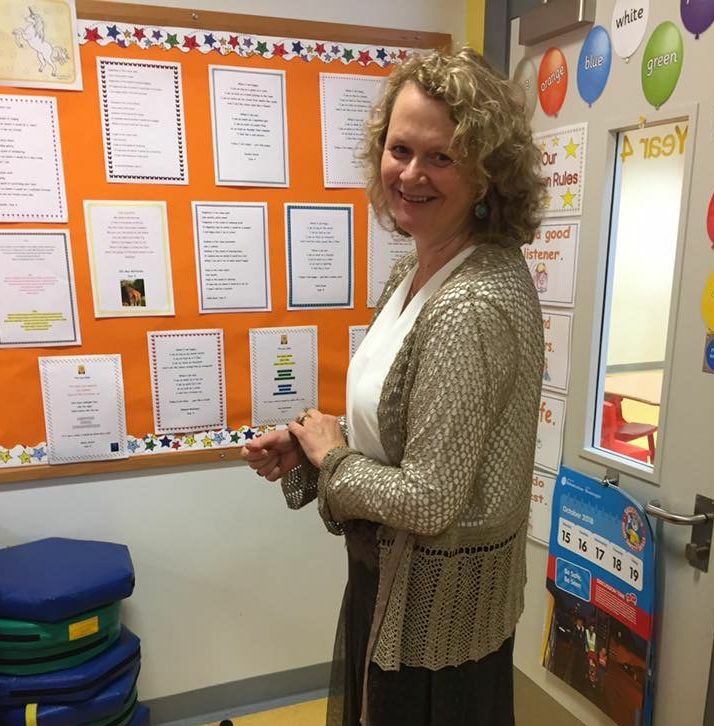 The students of P4 are blessed with having a teacher, Joanna Mitchell, who is enthusiastic about literacy and creativity. Ms Mitchell was a joy to work with; a teacher who was supportive and trusted my way of facilitating. My first prompt in a young classroom is always with popcorn. I give each student some popcorn and ask them to look at the shapes to describe what they see. It is a simple exercise, but it means that within a few minutes every child has spoken to me and I speak to them. It lightens the room. The child that is anxious relaxes and I have a sense of the students. Ms Mitchell told me that the popcorn prompt was the moment that she saw all her pupils become engaged with the workshops. My hope for a class visit is that every student will write pieces, read their work out loud and have a pride in their own words. P4 did so with gusto. Ms Mitchell encouraged and supported her students. There is something special when a teacher says, “I can’t believe how well they all have worked.” It is important to me that it is the students’ own ideas and voices that are heard. The beauty of Poetry in Motion is the continuation of the process; the visits, recordings, anthology and the day in the Ulster Hall. Joanne Barrett, sound engineer, treated each student with patience and kindness as they recited their work for recording. I was extremely lucky to have two schools to visit this year; Eglinton PS, and Foyle College where I worked with another enthusiastic teacher, Barry Duffy and his wonderful Year 10 students. The day in the Ulster Hall brings a great pride in seeing students that you have come to know performing their work. It was such a well organised event. The schools all took part and then came the announcement of prizes. 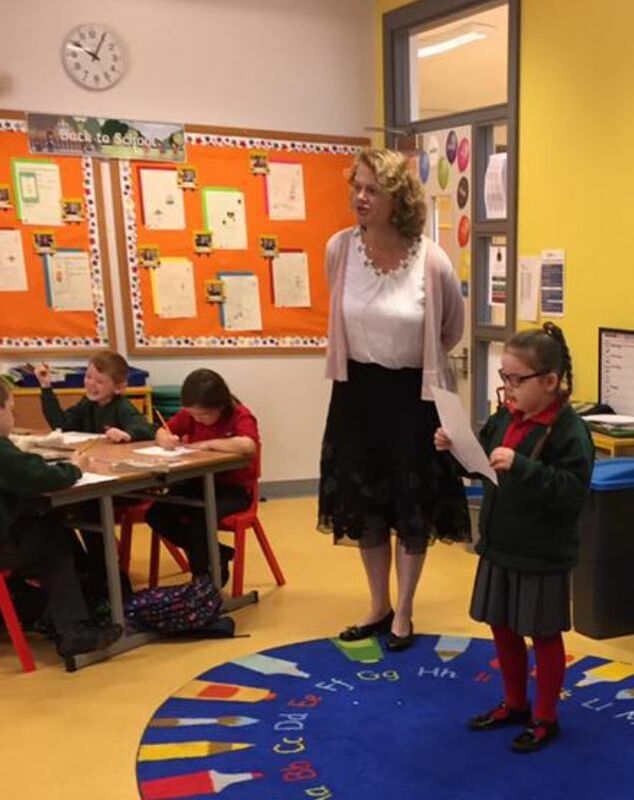 When Eglinton Primary were announced as the winners of the Seamus Heaney Award for Achievement, the students, Ms Mitchell, parents and I were all up on our feet cheering. Our bus journey home was electric. It wasn’t the World Cup that was carried into the school and the waiting parents, but it felt that way. All for poetry. I am grateful to CAP and the Poetry in Motion program; to Shelley Tracey for her support and all her organisational work – the anthology, The Colour of Light, is beautiful -; to Conor Shields for his passionate belief in the program; to Barry Duffy and the Foyle College Students; and congratulations to Joanna Mitchell and P4 students on their well-deserved award. Thank you, I am the better for having facilitated this project.